It was fun to make this month's Daring Bakers challenge: Filbert Gateau with Praline Buttercream from Carole Walter's Great Cakes book. I most definitely thank our host this month, Chris for choosing a fun recipe that was not nearly as time consuming as last month's Danish Pastry Braid. With the new puppy and various other projects this month, I was thankful for a "less involved" challenge that only took 1 day instead of 2. The recipe called for hazelnuts (Filberts) but we were free to use an alternate nut as long as we carried it through the entire cake. The recipe also called for an apricot glaze underneath the chocolate ganache but we were free to pick a different flavor. We had to keep the cakes round and while we could make minis, we couldn't make cupcakes. We couldn't use fresh fruit IN the cake, but could to decorate. And we had to decorate the cake with the praline buttercream. This gave everyone a chance to practice their piping skills! Not horrendous for someone who don't know jack about piping! Instead of spending my mortgage on hazelnuts (filberts), I chose to use pistachios. I decided to invite a handful of family over for a Sunday dinner to meet Lucca and (yes, truly) primarily to have folks around to whom I could feed my July Daring Bakers Challenge!! I knew the hazelnuts wouldn't have been as enjoyed as pistachios, so I didn't bother taking out the loan for them nor trekking all over town to find them. I had enough pistachios in the fridge. I also chose raspberry instead of apricot which just sounded better with the nuts. I chose Grand Marnier for all the places the recipe asked for alcohol. And then proceeded to do everything else as the recipe called for. I started this on a Saturday afternoon and intended to serve it on Sunday evening. First things first was the pistachio praline: You melt dry sugar over the stove - that's right, no added water; then add the pistachios once the sugar begins browning. That's all it takes to make, essentially, pistachio brittle! Pistachios waiting for the sugar ---- Pistachio Brittle ---- Holding the piece with 1 hand! After making the pistachio brittle, I ground it up in the food processor until it was almost a powder. But I intentially left it a little "bit-like" so that one would crunch on a bit of the brittle/praline as they sampled the buttercream. Really this cake is VERY MUCH like a sponge cake. I felt awful that I made it sit on the counter right-side-up after removing it from the oven instead of like this (from this blog entry). Of COURSE it dropped in the center! I had a bit of a problem using my new cake leveler. I think the cake was too dense for the wire to slice neatly through it. So I found myself pulling it and (of course) didn't end up cutting straight. I basically cut a thin wedge off the top of my cake - brilliant! Good thing this cake will be covered...so even though it looked awful during assembly, it was ALL hidden upon serving. After trimming the edges, you smother the entire cake with heated jam. I used raspberry after straining out all the seeds. This is supposed to "seal" the cake. I should have done a thin coat of buttercream after this to set up a nice base for the ganache - but I lost patience and didn't get to it; and therefore sacrificed the look a bit. The extra layer of buttercream would have smoothed out my sides instead of the "stepped" look it had. But it didn't affect the flavor, of course. Finally it was time for the ganache coating. For this I used Ghirardelli 60% bittersweet chocolate. The "funnest" part: pouring the heated Vanilla, Grand Marnier, Chocolate Ganache over the finished cake. It worked perfectly as per the directions, as long as one has patience and allows it to cool and thicken just a bit. 90° is the suggested temperature. Not too thick; not too thin. I decorated the top with my play on the original design but since I didn't have the #114 leaf tip, I winged it with my little #18 star tip. Oh? You wanted to see the insides?? Oh yes, and let's not forget to inform everyone how crazy I am. I actually made another cake to serve for dessert this particular night because I was concerned about how much people would like the challenge cake. I'm glad I did, because (not surprisingly) I get my palate from my family - and we're not fans of this type of cake. 9 out of 10 family members liked the Banana Cake better than the Pistachio Gateau. However, upon taking it to the office the next day (1/2 of the banana and 1/2 of the pistachio) the overwhelming winner was the pistachio. Goes to show you how much "Different Strokes for Different Folks" really is true. You can find the recipe written out on many other Daring Bakers' blogs - just something I never have the patience for since I write such prolific blog entries!
! !Click on the below picture and read the note!! It seems we frequently have overly ripe bananas around. However, I've gotten tired of making loaf after loaf of banana bread - especially since I'm not a gigantic fan of it. So I hit the web to find some alternatives... Banana Layer Cake with Cream Cheese Frosting sounded like one GREAT alternative! I mean come on... cream cheese frosting?! Isn't that like the biggest generic American favorite food? Up there with pizza and hamburgers?? You might even be able to put cream cheese frosting on celery (see #2) and get me to eat it! I didn't even know what I was looking for when I searched "banana" on Epicurious. But one of the first things that came back was this Banana Layer Cake with Cream Cheese Frosting from Bon Appétit over 10 years ago. I was sold immediately. I even went out and bought cake flour since so many of my recent recipes call for it. A lot of the reviews on Epicurious recommend adding extra banana and even extra butter. So why not? I had 4 bananas - about 1-3/4 cup worth and extra butter never hurt anyone['s tastebuds], right? So it was an easy decision. However, I made the cake a few days before putting it together and serving it, and therefore put the cakes in the freezer for a couple days. I wonder now if it was this that made the cake SO DENSE or if it was all the extra "wet" ingredients. It was almost like eating a dense banana bread sandwiched with cream cheese frosting - still not bad, but not exactly what I was going for. I'm going to try the recipe as-written next time. It was good - actually got 9 out of 10 thumbs up compared to the other cake I made that night (coming soon in a blog entry near you!) But I'm really hoping the cake is softer/fluffier with the recipe written as is. I attempted to brûlée the banana slices on top of the cake, but I think they were too wet to work right. I was in a hurry by this time - ready to serve - so it's okay that it didn't work out. You can barely see the slightest browning on the edges. She's been with us for 2 weeks. She's got "sit", "down", "up", "come" and "leave it" covered quite well so far. She's handling home-alone like a big girl (dog). I'm COMPLETELY smitten. I find myself sneaking into/out of work late and early to spend snippets more time with her each day. I can watch her sleep and am thoroughly entertained. I pick up poop with only a thin plastic bag separating my hand from it. I get up earlier than I've risen for ANYTHING in order to responsibly train my little thing to do her little thing outside. I post picture after picture for friends to see. I always have my camera within reach for videos and stills. I'm a proud new mom. She won't fit under the stools/chairs for long! Perhaps my maternal instinct has always been strong. Perhaps the clock is ticking. Or perhaps - we are just in love with that sweet face and big eyes, and willing to go far out of our way for this soft, cuddly, precious, little animal. Our lives have definitely changed. But I don't think either of us is regretting it. I feel busier than ever before - but in a different way. We're trying to beat the clock to get her fully socialized, bite inhibited and handled by the time her 12 week birthday hits. 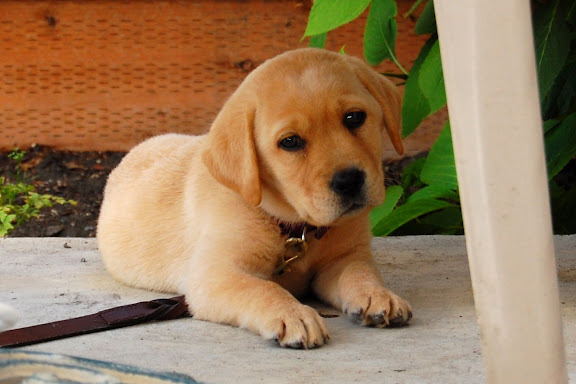 These are all very important things to address with a young puppy while they are in their most impressionable state - age 8-12 weeks! So we're busy! Introducing her to everyone who asks - including everyone who's asked's various nieces and nephews! Very important for a puppy to be handled by and play with young children since children are so unpredictable. Since I plan/hope to have kids in her lifetime - we have to make sure she's totally comfortable with them right now. She loves lying underneath things - especially outside on a nice day! But Lucca is comfortable with EVERYONE. Puppies, dogs, big people, small people... she loves everyone. I think she's going to be a very well adjusted doggie. I think we are going to love her deeply for many years. She's already gotten a lot bigger - gained 3 pounds in 2 weeks!! I've perhaps requested it in passing to friends but never outright asked on my blog - that people let me know they're reading and enjoying. Not all at once or in a ridiculous over-abundance of comments. But I love occasionally knowing that you are reading and entertained by what I'm writing (or laughing at it, or thinking I'm retarded, or disappointed in how un-cool I have become in my "old age"). But just knowing that I'm writing something folks are reading - for whatever reason - gives me incentive to keep writing. This blogging thing is fun, but only if it seems useful and enjoyable for others. I was very flattered to be tagged by Fay over at A Beautiful Mosaic for my very first Meme. I mean heck, I love her blog (and photography) and visit it all the time. So in being tagged for a Meme, I feel in a way that at least this someone must be enjoying my blog! Thanks Fay! And thanks to all of you who do in fact comment - I take it to mean you regularly read as well and it keeps me blogging! Since I think a handful of you (my "trusty readers") are not big bloggers - allow me to explain. Every now and then different bloggers tag each other and essentially ask for a little information - really in order to get to know the others better. As I would assume most other bloggers do as well, I like to keep a certain level of anonymity. But a meme isn't so much personal info as interesting info. Deux) Celery is the devil's food. I detest it in every form except cooked down so much that you can no longer taste or recognize it. Trois) In the last 8 years I have traveled to all the following countries/areas outside the US: Canada, Mexico, Caribbean, Puerto Rico, China, Taiwan, Thailand, South Korea, India, Singapore, Britain, France, Germany, Italy, Switzerland, Czech Republic & Holland. 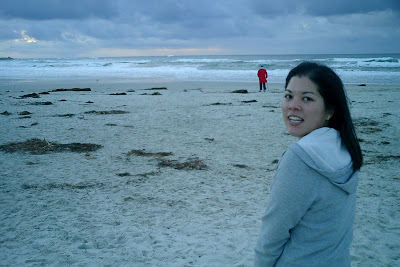 Prior to 8 years ago I had not yet left North America. Quatre) The only jobs I held prior to working in large corporations (ergo: high school/college) was nannying and baby-sitting. At the age of 9, I began sitting for my cousins ages 4,3,2 and under 1 (that sounds like some kind of child-labor law violation now, right?) I was known in HS as the "twin nanny" and cared for multiple sets of twins after school. Those years in high school, sitting in affluent neighborhoods, were perhaps collectively the wealthiest time of my life! 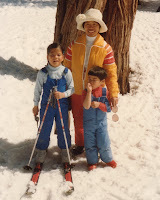 Oh yea - my favorite books of the time: returned upon Googling "babysit"
Cinq) I learned to snow ski at age 3 and skied every year until my early-20's yet I still have awful form. Six) I took 4 years of French in high school and college. You now know how much cooler (weirder, boring-er...) I am having just read that. Yes, it's long - that's what you get when you ask me to talk about myself. Just call me Narcissus. On to my 6 tags - I decided to select fellow May Daring Bakers who joined with me a couple months ago. Go Class of '05'08!! Please don't feel obligated to do this - it's only for fun!